A walk on the famous Wildwood Trail through Washington Park is a reminder of what's so wonderful about Portland. What other city would have a forest path from a zoo to a mansion with a mountain view? About the Hike: Portland's Wildwood Trail is more than 30 miles long, but this relatively short loop gives you a good sample of its charms. The hike starts and ends conveniently at the Washington Park MAX light rail station between the Oregon Zoo and the World Forestry Center. Difficulty: An easy, 3.6-mile loop to the Hoyt Arboretum gains 500 feet of elevation. A moderate 7-mile loop to the Pittock Mansion gains 800 feet. Getting There: From downtown Portland take the Hillsboro MAX light-rail train to the underground Washington Park station and ride the elevator up. If you're driving, head west from Portland on Highway 26 (Canyon Road) toward Beaverton, take the zoo exit, and park at the far end of the zoo's huge parking lot beside the MAX station, opposite the World Forestry Center. Hiking Tips: From Washington Park's MAX station, you can walk up the road 100 yards to a sign marking the start of the Wildwood Trail on the left. But along the way you'll pass the steps for the entrance to the Vietnam Veterans Memorial-and it's actually more dramatic to start your hike here, going under the memorial's bridge and following its spiral path up to the Wildwood Trail. From there on, expect trail junctions every few hundred yards. Just keep an eye out for the Wildwood Trail signs. Within 0.4 mile you'll cross a paved road and pass a huge green water tank to a viewpoint of Mt. St. Helens, Mt. Rainier, and the Pittock Mansion, a potential goal of your hike. After 1.7 miles you'll get a glimpse down through the forest to the Oriental bridges and manicured greenery of the Japanese Garden. Detour down to the right to visit the garden if you have time. Otherwise continue on the Wildwood Trail, which now climbs, crossing several paved roads and a ridgecrest before descending into the Hoyt Arboretum. 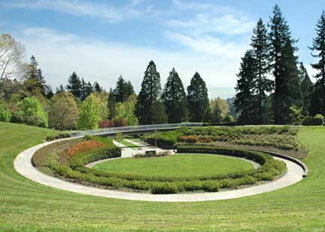 Arboretum means "tree museum," and in fact this entire valley is filled with native and exotic trees. You'll switchback down through ponderosa pines and then traverse an impressive grove of redwoods and sequoias. Finally you'll reach a footbridge over a creek. If you're wearing down, or if you're hiking with children, turn left onto the Creek Trail here to complete the shorter, 3.6-mile loop. In this case, follow the Creek Trail across a paved road, turn left onto the Hemlock Trail, and take that path over the ridge (crossing Fairview Boulevard) back to the Vietnam Memorial. If, however, you've got enough energy for a 7-mile hike, continue on the Wildwood Trail through the Hoyt Arboretum. Soon the path crosses Burnside Street-a busy, frightening highway you'll have to cross at a run. Then the trail climbs 0.9 mile through forest, crosses a paved road, and reaches the Pittock Mansion parking lot. Walk through the portico on the manion's left side to the spacious front lawn where there's a magnificent view of downtown Portland. History: The Pittock Mansion was built in 1909-14 by Oregonian editor Henry L. Pittock. The elegant 16,000-square-foot mansion is surprisingly modern, with an elevator, intercom, and central vacuum cleaning. Tours are available daily between noon and 4pm (adults $6, kids $3). Geology: Although Ice Age glaciers never reached Portland, their outwash plains repeatedly filled the flatlands with dusty silt. During arid interglacial periods, huge dust storms blew silt onto the hills, leaving a layer of slippery topsoil up to 30 feet thick. Prolonged rains can launch landslides. As a result, the construction of roads and buildings has always been problematic in Portland's west hills. This in turn has allowed the preservation of large areas of relative wilderness in Washington Park, the Hoyt Arboretum, and Forest Park.